Visual Studio Code>SCM Providers>Perforce for VS CodeNew to Visual Studio Code? Get it now. perforce.ignoredChangelistPrefix string Specifies the prefix of the changelists to be ignored. perforce.hideNonWorkspaceFiles boolean Hide non workspace files in the SCM Explorer. Default changelist only submits files that are opened in current workspace. Warning: If you submit other changelists than the default it will submit files that are not visible. perforce.hideShelvedFiles boolean Hide shelved files in the SCM Explorer. perforce.hideEmptyChangelists boolean Hide changelists with no file in the SCM Explorer. perforce.bottleneck object Experimental Throttle all perforce commands via bottleneck. This allows you to work with different repository within the same editor. See Multi-root Workspaces - Settings for more details. 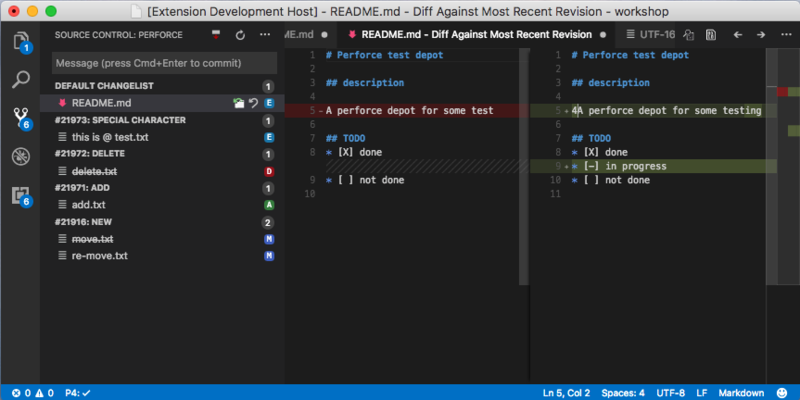 Visual Studio Code now allow to choose which Source Control Manager to use. A: Increase perforce.maxBuffer in your user settings. A: Great :) Try to set the experimental setting "perforce.compatibilityMode": "sourcedepot"